The Mystery of The Four Ages Unveiled. "A lifting of the veil that has shrouded the scriptures in mystery for ages"
This website examines the research of Edward B. Latch and William D. Ashworth, and continues the quest for new light with Albert R. Parsons, amongst others, with rewarding illumination! The altar to the LORD. The Great Pyramid of Egypt. The mystery entrance below the main entrance, does have myths to it's origin with the reigning Caliph of "that time", but, this mystery entrance was built "on purpose by the builders themselves", and partially hidden, and revealed to those who sought entrance. (...the stone falling...) There was "evidence" of a prior forced entrance than in the days of Al Mamoun's chiseled entrance. A "veiled" entrance is what we have uncovered here. In the building of the Pyramid, are held great mysteries, but little did they know, it is our "Bible Cast in Stone". A Mystery Solved! Paul aka Nemesis8 - your host. 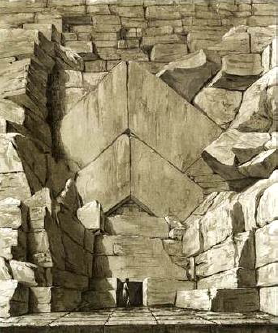 "From the foregoing indications as a whole it becomes manifest that the forced entrance on the north side of the Pyramid was thus introduced by the builders of the Pyramid as a veil, and as though an after-consideration; and so, also, the death which it shadows through the Deluge of Noah, although foreseen, was as an after-consideration following with transgression of the more finished work of the Law. In this light the well or pit which descends from the allegorical junction of the Euphratic, Hiddekelic, and Gihonic ages down to the great tube that leads into the chamber of universal death shadows the valley of the shadow of death, as a consideration also forced through transgression of the Law."